Doing Business 2017: Equal Opportunity for All finds that entrepreneurs in 137 economies saw improvements in their local regulatory framework last year. Between June 2015 and June 2016, the report, which measures 190 economies worldwide, documented 283 business reforms. Reforms reducing the complexity and cost of regulatory processes in the area of starting a business were the most common in 2015/16, as in the previous year. The next most common reforms were in the areas of paying taxes, getting credit and trading across borders. Read about business reforms. A number of things jumped out at me. First off, the rankings of the oft-praised Nordic countries, particularly Denmark and Sweden. See how those two countries compare to the U.S. below. World Bank Rankings Denmark Sweden U.S.
research shows that where business regulation is simpler and more accessible, firms start smaller and firm size can be a proxy for the income of the entrepreneur. Doing Business data confirms this notion. 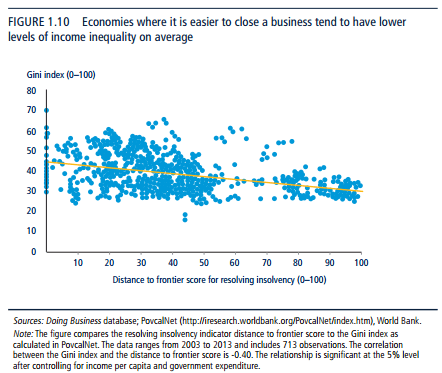 There is a negative association between the Gini index, which measures income inequality within an economy, and the distance to frontier score, which measures the quality and efficiency of business regulation when the data are compared over time (figure 1.8). 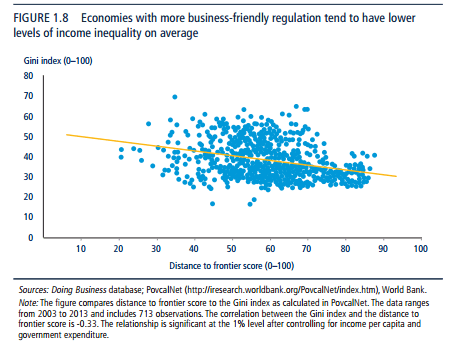 Data across multiple years and economies show that as economies improve business regulation, income inequality tends to decrease in parallel. Although these results are associations and do not imply causality, it is important to see such relation. The results differ by regulatory area. Facilitating entry and exit in and out of the market—as measured by the starting a business and resolving insolvency indicators—have the strongest link with income inequality reduction (figures 1.9 and 1.10). These two Doing Business indicators are focused on equalizing opportunities and access to markets (pgs. 11-12). 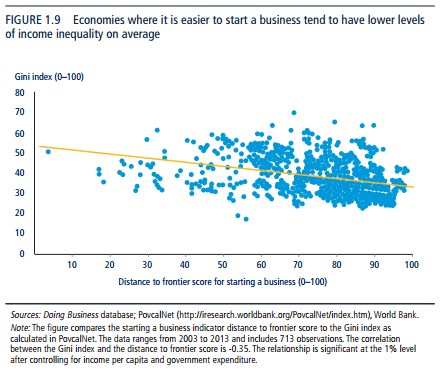 In short, lower income inequality is correlated with simpler, business-friendly regulations. Anyone worried about income inequality should take note. I recommend taking a look at the data for yourself. Lots of good stuff. Full rankings found on pgs. 203 (Denmark), 242 (Sweden), and 248 (United States) of the full report.